Wells Fargo's notorious pressure-cooker culture led the bank to force some hourly employees to work late without overtime pay, former workers say. The mandatory overtime took place during "call nights," where workers would call customers to sell them additional products like credit cards in an effort to meet the unrealistic sales goals. 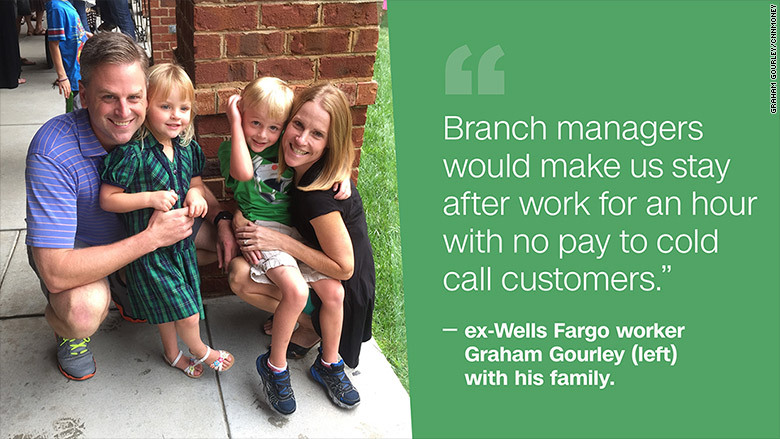 "If we didn't hit our numbers, branch managers would make us stay after work for an hour, with no pay, to cold call customers and try to sell accounts," Graham Gourley, who worked as a Wells Fargo banker in Charlotte until 2012, told CNNMoney. 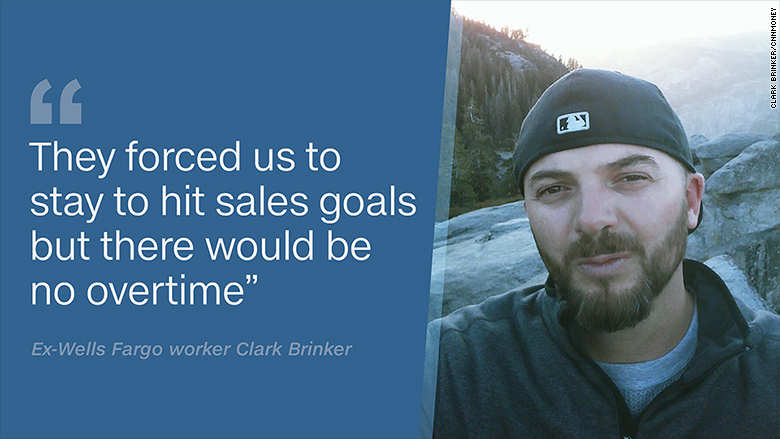 CNNMoney interviewed nearly a half-dozen additional former Wells Fargo (WFC) workers who said they too were frequently forced to work overtime without extra compensation as they chased their sales targets. This week, Wells Fargo scrapped the sales goals, amid the firestorm engulfing the bank. Allegations that Wells Fargo violated federal law requiring overtime pay for hourly workers go beyond the fake account scandal. So-called "wage theft" complaints and related class action lawsuits go back to 1999, according to U.S. Senators who requested the Labor Department investigate whether the company "aggressively skirted overtime laws." The letter to the Labor Secretary, signed by Senator Elizabeth Warren among others, cited the "staggering neglect by management," and pointed out how Wells Fargo stands out among all banks for repeatedly violating wage and hour provisions of the law "by denying employees overtime pay for hours worked in excess of 40 hours a week." 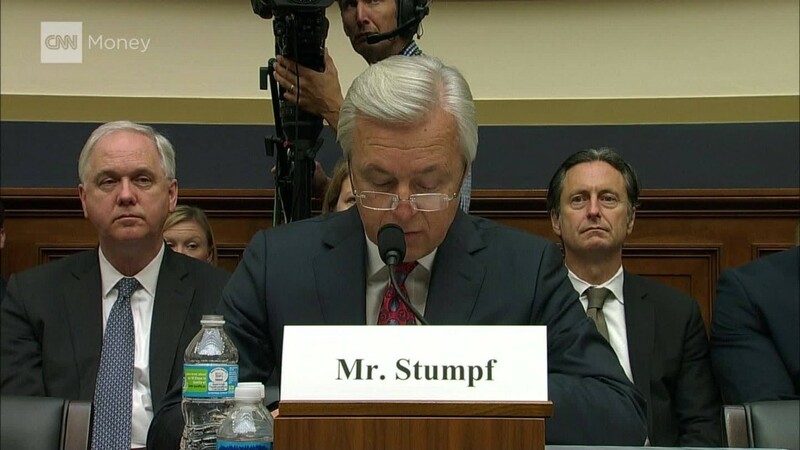 This week, the Labor Department has launched a "top-to-bottom review" of Wells Fargo complaints related to the Fair Labor Standards Act (FLSA) and other labor laws. Effective in 1999, FLSA requires employers to pay workers overtime rates of at least one and one-half times the regular rate after 40 hours of work in a workweek. In response to the allegations raised by workers who spoke to CNNMoney, Wells Fargo said "employees are compensated for all hours worked, including all overtime hours." The company said it "complies" with FLSA and "all applicable state and local laws." Wells Fargo also pointed out that its handbook requires employees to report all hours in an online system and notes that they are "entitled to pay for all hours actually worked, even those exceeding your regular schedule or those not authorized before working them." However, Gourley said he wasn't allowed to input his hours beyond 5:30 p.m., when his shift technically ended. If he did, Gourley, who was making $15 per hour plus commission at the time, said the managers would go in and change it. Efforts to push back about unpaid wages were met with stiff resistance, Gourley said, echoing what other employees have also told CNNMoney. "They said, 'Deal with it -- or leave,'" Gourley recalled. "I have a wife and two young children. I didn't have a choice. I had to keep working to make ends meet," he said. Gourley gave in to his branch manager's instructions to open unauthorized accounts -- the problem that has landed Wells Fargo in hot water with regulators and Congress. Gourley said he tried to push back against the orders to open fake accounts, but was unsuccessful. "We were forced to do that -- under the threat of termination. The entire branch was doing it," Gourley said. Gourley said Wells Fargo bullied him into signing a false confession for opening unauthorized credit cards, leading to his termination in 2012. The firing put a red flag on his securities license, making it difficult to find another job. "I lost my home and was forced to go on welfare and food stamps for almost a year," he said. Gourley has since rebounded and is today happily employed at a restoration company. Clark Brinker, who worked for eight years as a business banker at Wells Fargo said: "They would make us stay late, but there would be no overtime." Brinker was making $20 an hour plus commission when he left the company. Brinker said he joined a class action lawsuit for overtime pay while he was at Wells Fargo. He received a check for $540 as part of the settlement. Brinker worked at Wells Fargo from 2002 to 2010. He said the unpaid overtime started at his branch around 2008 and took place at least once or twice a week. He was fired in 2010 after Wells Fargo accused him of a type of check fraud, a charge he denies. Ironically, the mandatory overtime helped lead to the current fake account problem Wells Fargo is being pummeled for, Brinker said. "A lot of people would make up accounts so they could leave," he said.